Note: I’ve updated this story to clarify and expand on the role of human-caused climate change in western wildfires. See below. As of this afternoon, 77 large fires are burning across 1.4 million acres in eight western U.S. states. That’s an area more than three times the size of Houston. The burning is part of a long-term trend of increasing wildfire in the West, brought on by a variety of factors, none more significant, according to recent research, than human-caused climate change. Hardest hit by fire right now is Montana, with 26 large wildfires blazing today across 662,105 acres, according to the the National Interagency Fire Center. The animation above, consisting of imagery acquired by the GOES-16 weather satellite on September 3, 2017, shows enormous amounts of heat rising many of those fires, detected in the infrared, along with massive plumes of smoke. Smoke from the fires has been smothering vast swaths of territory. I’ve been looking at a variety of satellite imagery and to my eye it seems that smoke from the western U.S. fires (possibly mixed with smoke from Canadian wildfires) has blown all the way across North America, out over Greenland and across more than half of the Atlantic Ocean. If you look in the upper right corner in the animation, you might be able to spot some smoke blowing out over the Atlantic. The animation is created using data acquired by the Moderate Resolution Imaging Spectroradiometer, or MODIS, on NASA’s Terra satellite. It shows aerosols in the atmosphere, with redder tones indicative of higher concentrations. These tiny particles can come from a variety of sources, including dust, sea salts, volcanic ash, pollution – and smoke from wildfires. As you watch the animation, follow the red as it spreads across the continent and then out into the Atlantic south of Greenland (which is visible in the upper right). The first frame, acquired on Aug. 30th, and the last frame captured today (Sept. 4), linger longer than the others. If you’re wondering why the last frame shows only a small part of North America, that’s because as I’m writing this post on Monday afternoon, Terra has not yet imaged the rest of the continent. This imagery consists of data acquired in the visible and near-infrared part of the electromagnetic spectrum. In these kind of views from Meteosat-10, smoke typically appears in bluish tones and is more visible in the early morning or late evening. The images in this animation were acquired as evening approached on Aug. 29 and Sept. 3, 2017. In the Aug. 29th view, a faint light-bluish cast can be seen below Greenland’s southern tip. By Sept. 3, the bluish cast, which I’ve circled in red, is far more pronounced. I’ve been personally affected today: I had to bag my run this morning here in Niwot, Colorado because of particle pollution from smoke blowing in from the west. It was so bad that the Rocky Mountains, normally visible from near my house, were totally obscured. The photo-mosaic above shows the view from a trail near my house on a day when the atmosphere was free from smoke. The foothills of the Rockies are clearly visible on the horizon (with a beautiful elongated cloud above them). I should add that I’ve seen conditions like this when wildfires were burning closer to home, in western Colorado. But never this bad from fires that are 800 miles and more away. This isn’t just some isolated pocket of bad air. Millions of people across the West are being affected, as the national air quality map above shows.
. . . human-induced climate change has doubled the area affected by forest fires in the U.S. West over the last 30 years. According to the study, since 1984 heightened temperatures and resulting aridity have caused fires to spread across an additional 16,000 square miles than they otherwise would have—an area larger than the states of Massachusetts and Connecticut combined. The authors warn that further warming will increase fire exponentially in coming decades. This year’s fire behavior may be just a foretaste of what’s to come. | Update 9/7/17: The original version of this story said that the burning “is part of a long-term trend of increasing wildfire in the West, brought on by human-caused climate change.” Since I wrote that, people have rightly pointed out that other factors have contributed to a rise in wildfire activity. So I’ve modified my story to acknowledge that. But while it is certainly true that fire suppression in particular has made some forests prone to burning more severely, research shows this is not true of all forest types. Far from it. Here along the Front Range of Colorado where I live and work, for example, research has shown that the severity of modern forest fires is not very different from that of fires that occurred in the region before fire suppression began affecting our forests. One exception are some low-elevation ponderosa forests. But these very much are the exception, not the rule, according to the research, conducted by a team of scientists that included my University of Colorado colleague Tom Veblen. Recent large wildfires in the Front Range are not fundamentally different from similar events that occurred historically under extreme weather conditions. So, you might ask, if fires in these forests aren’t more severe, what’s the fuss? The answer is that severity has increased in some forests — and also that wildfire severity isn’t the only factor we should care about. Duration of the fire season, the number of fires, and the size of fires are other really important factors. And all are increasing, thanks to climate change, more than any other contributing factor. A paper titled “Climate-induced variations in global wildfire danger from 1979 to 2013,” published in 2015 in the journal Nature Communications, found that fire weather seasons have lengthened across 25 percent of Earth’s vegetated surface, resulting in nearly a 20 percent increase in the global mean fire weather season length. The research also showed a doubling in the area of the globe’s burnable area that has been affected by long fire weather seasons, and an increased frequency of long fire weather seasons across 53 percent of the planet’s vegetated surface during the second half of the study period. Although numerous factors aided the recent rise in fire activity, observed warming and drying have significantly increased fire-season fuel aridity, fostering a more favorable fire environment across forested systems. We demonstrate that human-caused climate change caused over half of the documented increases in fuel aridity since the 1970s and doubled the cumulative forest fire area since 1984. The statement released by Columbia University’s Earth Institute was a lie. The U.S. Federal Govt. has been a POOR CUSTODIAN of this inestimable heritage, as our federal government has FAILED to do what generations of plains Indians did successfully, for many centuries, which is to burn off the scrub brush every year in controlled burns. Controlled burn-off protects the trees as there is only fuel to burn out the smaller shrubs and deadfall. It can be both. Great statement. Global warming is a farce. We are experiencing A weather cycle, look back through history. agreed, anything to increase the so called awareness of global warming (won’t use the new term even though PC demands I do). It’s a money making scheme that seeks to do NOTHING other than profit. In 1967 they were flogging 67 years of Global Cooling. Global warming = the increase in global temperatures due to increasing atmospheric concentrations of greenhouse gases. The term is patently self-explanatory — that is, if you aren’t so encrusted with political ideology that simple logic cannot penetrate. And for the record, climate change = what happens when global temperatures rise as a consequence of increasing amounts of energy being retained in the climate system. E.g., sea level rise, more intense and longer lasting heat waves, and, yes, longer wildfire seasons and more acreage burned. couldn’t explain your position without an insult, typical leftist. go ahead and give your money to the cause. the earth has always warmed and cooled and does not need us to help it. i do admit our pollution is accelerating the process, but is not the sole cause. and pollution in today’s day and age is alot less than what it used to be due to regulations and advancements in technology. but hey, enjoy your delusion. this current scheme is a money grab. why is it the people so most concerned with it are liberal with causing the most pollution? Al Gore…and his ilk live in multi million dollar pollution causing homes…..care to comment on that? probably not. Please don’t talk like that about “special” people. Under socialism, and it’s cousin, some folks are “more equal than others”. Explains the Clinton’s running free and Al Gore! You are entitled to your own opinions, but not your own facts. Read my update to this story for the details on the issue of forest management versus climate change. I deal with the question of forest management’s role in wildfire trends, providing the science to back up my points. Bottom line: Human-caused climate change is the dominant factor. Moreover, it’s downright naive to think that what works on the plains is relevant to multiple different kinds of forests at different elevations and latitudes in a mountainous region as vast as the West. You want to blame everything on the government, because that is your ideological bent. But science paints a much more nuanced picture – except for one indisputable fact: In recent decades, no factor has played a greater role in extending the fire season and expanding the acreage burned each year than human-caused climate change. My words- Great Article, volcanoes spew more garbage into the air every year than what we humans do in 3-5 years. I’m all for trying to help and reduce our human footprint, but WE humans are not the cause of climate change/ Global warming. volcanoes spew more garbage into the air every year than what we humans do in 3-5 years. WE humans are not the cause of climate change/ Global warming. Agree to some extent with Jonathan. 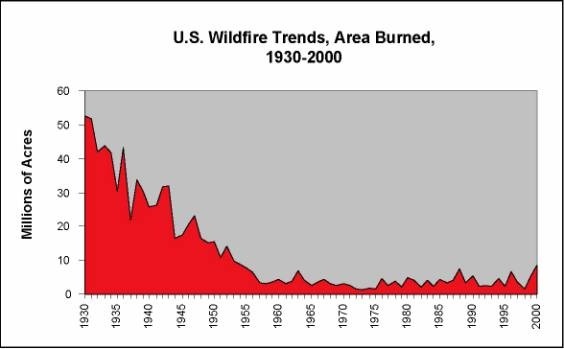 Forest management has quite a bit to do with yesterday that and the overall convergence of weather, time of year and so much fuel on the ground has contributed more to forest fires today than over time of a millennia past. To attribute forest fires in general being a consequence of Climate Change is missing some basics. True the climate may be drier causing more fires at the same time as less rain means they are larger fires or without rain they will not die out naturally. Not until white settlers came along and started putting out the fires have the forests become over-grown, diseased, and without turn over in favor of new growth. Beetle kill is a contributing factor as well. The forests, from a geographical perspective have long reached their Forest Climax and are long overdue to follow natural processes that regenerate into healthier trees. Forest fires are one aspect of that natural process. Additionally forest management could be better if better funded by the government. I also am quite remiss to not mention previously, this is a great entry! the information, the graphics and demonstrations are fantastic. I am not a Climate Change denier, I think it is still the issue of our times and in favor of any discussion and policy that would contribute to reversing it. Beetle kill increase is a result of climate change. Not all forests are overgrown. Research shows pretty conclusively that beetle kill mostly does not increase fire behavior. Tom, I agree. I was merely pointing out what I perceived as incorrect statements by the commenter. Read my update to this story. 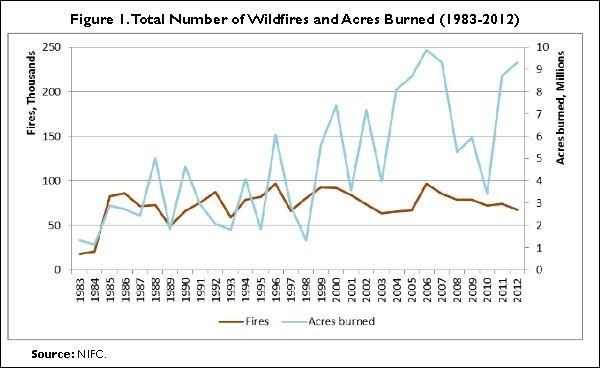 I deal with the question of forest management’s role in wildfire trends, providing the science to back up my points. Bottom line: Human-caused climate change is the dominant factor. Environment organizations to blame for our fires! Clayton Marlow, a Range Ecology professor who teaches a Fire Ecology and Management class at Montana State University. Dr. Marlow: I think, first and foremost, what has been missed is taking all the science that the Forest Service itself and its sister agencies through the Joint Fire Science program have developed and it has not gone to policy. For example, there is study after study that shows that prescribed grazing or targeted logging practices greatly reduce the spread and the severity of fires. I want to really repeat that the prescribed grazing and logging will reduce the severity and spread, it won’t prevent the fire, but it will make less catastrophic and easier to control. Many are making claims that much of the blame falls directly on the federal agencies, claiming gross negligence and mismanagement of our nation’s forests and rangeland by the U.S. Forest Service and Bureau of Land Management particularly this year as it deals with an unprecedented fire season as seen across the western U.S. this year. Dr. Marlow shares his thoughts on what the problem actually is. Dr. Marlow: Yes and no, I think that’s a case of throwing the baby out with the bath water. I think that most federal agencies are very aware that there is unhealthy forests, and grasslands that are prone to catastrophic fires. The problem is we have a group of environment organizations that have learned to make money by suing the federal government. And they have so tied the hands of the federal government with lawsuits, that the agencies can’t 1. Get to the project on the ground and 2, Don’t have the resources to put it there because they are paying court costs. So rather than blaming federal agency, I think its a segment of our society that is to blame. Its important to note, that most of the plant communities in this part of the world, evolved from grazing and fire and when we remove both we make them very unhealthy and very vulnerable to climate change. My words- Great Article, volcanoes spew more garbage into the air every yearn what we humans do in 3-5 years. Research shows that wildfire activity in the western United States has increased dramatically, thanks to our emissions of greenhouse gases. But our greenhouse gas emissions have dropped, mostly due to fracking I would think. You could make the case that drier conditions and acres burned do roughly correlate with gas emissions, but there are dramatic swings in acres burned which point to significant factors other than gas emissions. Then again, we could have a problem with too small of a sample size from the 1980’s to present to really draw intelligent conclusions from. Long story short, I don’t know. I don’t pretend to be a scientist. I am a lowly ink-stained wretch. But I know how to report on what scientists are finding, and to write about it in a way that many people can understand. So if you’re interested, read my update to the story for more details about the role of human-caused climate change. Humans have not repealed such natural factors as El Niño and La Niña. They still have an impact. But they are superimposed on a long-term rising trend that research attributes mostly to human-caused climate change. Read the update to my story for more information. Those seem totally unrelated items. Look at the chart carefully, The levels of everything except Carbon dioxide seem the same, with the levels of C2O relating to the fires occurring. 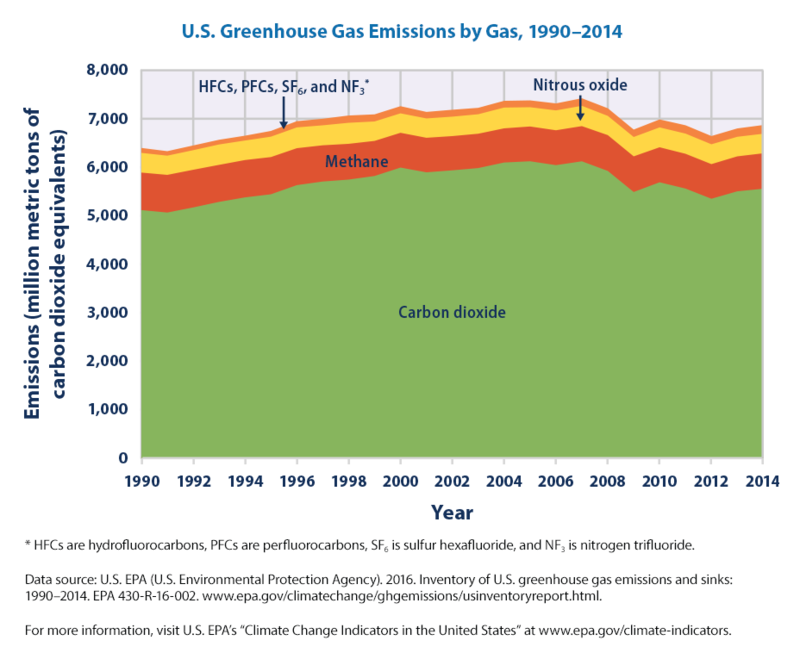 Yes, in the short term (a matter of a few years), emissions in the United States have dropped. 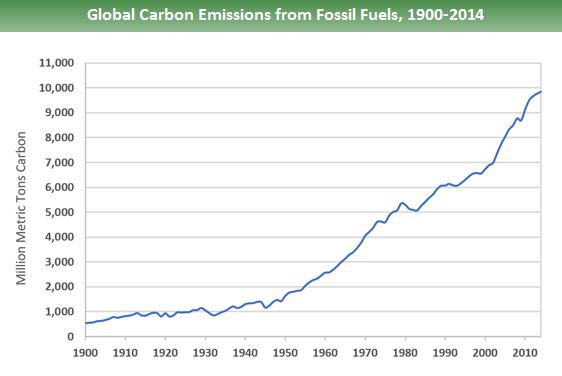 But emissions from other nations have grown. And the concentration of CO2 in the atmosphere continues to increase. So I’m honestly not sure what you’re trying to say here. As usual, folks have to be reminded of a couple things! First, forest fires are natures way of promoting biodiversity in flora and fauna. Some species of trees and some species of insects and animals could not exist without forest fires. I wonder what the “natural” number of fires / acres burned would be like if you eliminated arson and accidents? Lightning caused fires would presumably be more common the closer to the equator one measures. Eliminate arsonists, campers, hot exhaust pipes over grass, flipped cigarette butts, emptied ash trays and you’d probably have the 15% left to Mother Nature. You’re out of your league, Mr. Amateur Scientist. You don’t know what you’re talking about. When I see your government management of your devastated inner city ghettos, excuse me for being cynical of their ability to manage forests! MY government management of MY devastated inner city ghettos? Who the hell do you think you are? I was speaking merely of the generic yours, in the U.S. as opposed to mine, in Canada! You know, your Hollywood, your politicians, your music, that sort of thing. When I saw Dana here, I knew “me too” Mikey would’t be far behind! Having a life away from Discus boards. You might want to try it some time! Who is the self-important MORONIC pos who wrote this piece of trash?? Climate change, my @ss. Mother Nature creates and she destroys. Such is life on this planet. Bad land management definitely plays a role as well. And WTH is this, “I have been personally affected” BS?? Biotch please!! You couldn’t run today, boo frickin’ hoo. Who cares?? You should change your name to Drama Queen. There are actually REAL PEOPLE who’s lives have been devastated by all of this. Get over yourself. Good bye Donna. For being an ignoramus who is capable only of ad hominem attacks – as opposed to intelligent debate – you will be banned from this site permanently. But first, I will leave my comment here for all to see for a little while. Just so everyone can see you for who you are. Then your vile comment is coming down, and you will never be able to post here again. And yet, man warms the planet. internal ideals…effectively immune to fact. It’s this sort of infantile name calling and religious fervor that first made some of us question the global warming political movement in the late nineties. Every pronouncement must come with a ” shaming”.of those that question the divine wisdom. are just a few words used in this thread by the true believers in their “scientific” pronouncements here alone. This hate speech comes not from scientists themselves, but from left wing politicians, their pals in the MSM, and their faithful followers. There are three major scientific reasons why the AGW hypothesis should be questioned. 1. The “Greatest Scientific Collaboration in History, involving Thousands of the Best scientists from 120 countries all over the World” gave us their predictions in the IPCC 1990 FAR Report. It projected three temperature scenarios. All scientist agreed. The true believers called is “settled science”. 27 Years later it was simply, WRONG! at all three scenarios. Secondly NOAA and NASA publish two sets of temperature data. One uses ancient steamship intake valve records from 1880, ancient tree ring proxies, ancient ice core sample, ancient tidal gauges, weather balloons, and manually filled in adjustments for the 75% of the Earth’s surface that is not covered by terrestrial instrumentation. Terrestrial instrumentation covers about 25% of the Earth’s surface, while satellites cover almost all. temperature readings for almost all regions of the Earth. The July, 2017 warming anomaly over the 38 year satellite record was 0.28 degrees. Projected, that would be 0.24 degrees by 2050, and 0.61 degrees by 2100. assuming it continues without any pause, and with no margin of error given. Scientifically statistically insignificant, and while the Hollywood airheads today are proposing that Mother Nature is paying back humanity for electing Donald Trump, Lol, There is only left wing opinion that the weather has anything to do this statistically insignificant global warming! It is only brainwashed followers think they are very special indeed, who could possibly believe we have only 10 years to save the Earth, when it has been managing quite nicely for 4,500.000.000. Then, of course there are the “solutions”. Trying to figure out why acceding the the U.N. request for $1,500,000,000 per year in ‘climate change” reparations, when the U.S. is $20,000,000,000,000.00 is a debate for another day! Notice that, throughout this tome, not once was my basic question addressed. When corrected for the different times of day the measurements were taken, the satellite data was actually pretty close to measurements taken at surface monitoring stations. I’ve pointed this out to Ol’Wilson before, but he really doesn’t seem that interested in accuracy or intellectual honesty, does he? And for the record, despite his protestations about “shaming” and “infantile disrespect,” he’s quite the serial insulter himself. At the risk of slowing disrespect, I have to point out that this is what most folks consider hypocrisy. But I imagine you’ve probably figured him out already. You continue to post an article from the Washington Post’s weather page. But you did manage to add “hypocrisy” to the list of infantile name calling!. For the record, It is also noted that the post using the word, “vile”, was removed from this thread, in case I am accused of making that up! That square I bought in our betting game “when will hapless Wilson give up tropes X, Y, and Z?” just busted. Ah, well. I still have 7 more. All your comments deserve is ridicule. If you want a reply to your ridicule-worthy comments to be something other than ridicule, write something that doesn’t deserve ridicule. The information I continue to post is accurate, and shows that the information you continue to post is less so (and you know that’s the case). I told you I would be happy to correct your deliberate misinformation if you persisted in repeating it, didn’t I? I am a man of my word. Adios for now. The answer of course, is scientific evidence of accurate prediction models. What was flogged as The Greatest Scientific Report in the History of the World, failed miserably! Thirdly, scientific proof that sending $1,500,000,000 per year to genocidal Dictator Robert Mugabe, and other massive transfers of wealth to tin pot dictators at the U.N. will change the climate! There’s more but you are really not worth more of my time!